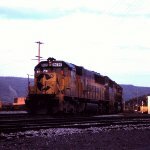 Description: CSX SD50 8639 proudly sports its Chessie paint in the early evening sun outside the Virginia Ave. office in Cumberland, MD. Kodachrome by C. Hash. Description: CSX SD50 8639 in Chessie paint leads 7 more locomotives in a light power move WB through Baileys Wye. Kodachrome by C. Hash. Title: CSX 8552 & HLCX 7232 about to approach the CP 382 Bldg. and Siganl Bridge with an EB Autorack. Title: CSX 8552 & HLCX 7232 leading an EB Autorack about to cross over Atridge Rd. and on to the "West Shore Branch"
Title: Love those old BN's. I'm sure the SD50 didn't start out a CSX either?! This EB Autorack is about to take the ra-cha-cha bypass!! Description: CSXT Northbound Freight Train rumbles through Lineville, Al. Description: CSXT Northbound Freight Train Q682 ( Waycross, Ga. to Nashville, Tn. ) passing through Lineville, Al. Description: Rare to see standard cab power leading an intermodal train. Description: Parked on the run-around track awaiting a crew. Description: This monster consist of UP and CSX locomotives - nearly 38,000 hp (all units were running) - was caught holding westbound on the CSX mainline at East Curtis. Featured were 5 brand new UP C45ACCTEs and GE demo unit #7605. Description: Seen earlier at Pine Junction in Gary, this westbound mixed freight led by a 38,000hp UP-CSX consist (all units were running) that included 5 brand new C45ACCTEs and GE demo unit #7605 is now seen holding near the CSX ex-B&OCT Euclid Ave. crossing. Description: Not a very good shot, but here's one more photo of CSX Q322 heading north to McGrew yard. The signals at North Kearsely can be seen in the distance. Description: Somewhat rare to see an SD50 leading a loading coal train these days. By Otranto Rd. Description: CSX 772 leads a load of eastern coal through Jenison on its way to the J.H. Campbell plant in West Olive, MI. Description: 772 leads a load of eastern coal through Zeeland on a snowy day. Description: A trio of veteran EMDs bring Q493 around towards East Jct. for its run south to Charleston, SC. Title: CSX 7925, 5410, 8552, and 8034 at Olney, IL.